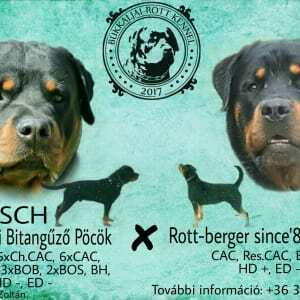 Hi, We are excited to announce that our kennel, Bükkaljai-Rott is planning a fantastic Rottweiler litter, due in April, 2019 from the sire and dam you can see below. We are taking reservations for these pups now, so send us a message or call us if you are interested! We are expecting puppies in “B Alom”. I've been breeding dogs for 2 years, since 2017. I am a member of the Magyar Ebtenyésztők Országos Egyesülete.